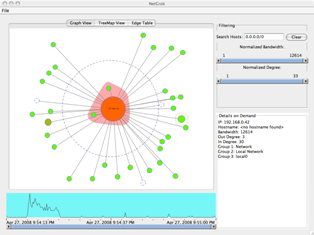 Netgrok is a tool for visualizing computer networks in real-time. NetGrok applies well-known information visualization techniques (overview, zoom & filter, details on demand) and employs a group-based graph layout and a treemap to visually organize network data. NetGrok also integrates these tools with a shared data store that can read PCAP formatted network captures, capture traces from a live interface, and filter the data set dynamically by bandwidth, number of connections, and time. NetGrok was featured in a cover story on security visualization for the September 2009 issue of Linux Magazine.